Chocolate: "You're a little too mischevious." Tira: "I'll give you a good spanking." ADV brings us disc two in Sorcerer Hunters (Bakuretsu Hunter) series, packed with another seven episodes of manic mayhem from our wandering band of wrong-righters. Like the first installment, the episodes are pretty self contained with a bad guy of the week, but there are elements of an underlying thread being put forward with each installment. From their control center, Big Momma (Sumi Shimamoto) and Dotta (Sakiko Tamagawa) assign the crew to their task du jour, and they set off to make things right, while Carrot (Shinnosuke Furumoto) tries to score with the local female population, much to the chagrin of his companions Tira (Megumi Hayashibara) and Chocolate (Yuko Mizutani). Despite the much better cover for disc two, the series has a lot less fan service than would be suggested by the artwork. Despite having a similar theme and the show's trademark transformation sequences, each episode has some nice original elements to its storyline. In the first episode, The Forbidden Fire, Carrot is exposed to a secret part of his past, that Big Momma has been keeping from him as he has grown up, which gives us a preview of what will come - eventually. It is also supposed to help him develop the ability to control his animal side, something he'll need to do if Tira and Chocolate aren't around to whip him (literally) back into shape. Their first adventure leads to a magician who is performing some strange rituals back in his castle, and the gang has to recognize that this is someone they'll be looking up to for a while, as they get the short end of the schtick. Next, in The Labyrinth Of The Opera House, Gateau Mocha (Kiyoyuki Yanada) comes face to face with the man who may have killed his partner when the gang is hired by an anonymous client, and Carrot is faced with a deadly dilema, and will need to find the purr-fect solution when the truth of the situation is revealed. In the To Love A Vagabond episode our band of Sorcerer Hunters deal with Kojino Dothsubo, a mage controlling a world of gambling, and their foe in this installment may not be what he appears. Our fearless hunters are seeing double in Forbidden Fruit - just remember that one bad apple don't spoil the whole bunch, girl. Then, in The Fossilized Warrior sometimes it's best to let sleeping serpents lie, but that wouldn't be any fun so with more than one way to slay a dragon, but when the team learns the truth about their mission, they have to decided whether the easy way is the right way. If you thought it wasn't getting out of hand enough already, things get really wacky when the Sorcerer Hunters find themselves living in a world where their dreams become reality, as things turn out to be triply confusing. But that certainly isn't the whole story... If they want to make it out alive, they'll have to do things by the book - that's what happens Between Dreams and Reality. Finally, we have to ask, is Carrot a God? When a young girl finds she is surrounded by those who will take advantage of her, the answer to her prayers may come in an unlikely form in God's a Big Fool. For fans of the show, these discs are a great deal, and we aren't getting quantity in lieu of quality either, as the presentation is very well done. The format also will allow those who don't feel this is worthy of a huge investment to get the whole collection for a pretty attractive price. While this may not be as much of a must-have as some other series, it is still a fun little show that can be enjoyed in one piece in a very long evening, or viewed sporadically without losing continuity. The characters are amusing, the stories have predictable outcomes, but interesting twists along the way, the animation is decent, and the backgrounds are really great. I'm really getting to like these characters and some of the unusual situations they find themselves in. Image Transfer Review: I was finding myself pleasantly surprised by the quality both of the animation and of the transfer in this release, as there is little to complain about. A bit of aliasing and a smidge of interlace artifacting are about all. The image has a very fine grain to it which is well preserved, with the only trouble areas being in dark blue sky scenes. Audio Transfer Review: The original Japanese audio track is well presented, and samples of the English dub seem consistent as well, though it does seem a few db quieter than the original track. Nothing really stands out good or bad about the audio, it serves its function well and doesn't distract from the viewing experience. 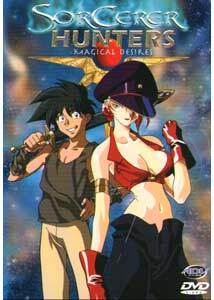 Extras Review: Previews for other series are located in a submenu, and this disc features a couple of upcoming series I'm looking forward to, Those Who Hunt Elves, and The Original Dirty Pair. Also included are Blue Seed, Gasaraki, Orphen and Martian Successor Nadesico. With seven episodes on the disc, there aren't a ton of extras, though another set of character bios covers Carrot, Marron, Gateau and the bulk of the bad guys on this disc. There is at least one bio that contains some major spoilers for stuff that hasn't occured in the series yet, so I'd pass on these until later. The show's clean opening and end credits are also present. While the episode selection is at least numbered this time around, I like having the episode titles available on this screen. ADV has atoned for their past sins with the cover for this installment, which is of the mucho-fanservice variety (seen previously on the VHS release), with an even more standout insert card and disc artwork. The spine art also is a vast improvement, and assumedly will match the redesigned first cover and the rest of the set. I did experience a bit of glitchiness when chapter skipping the closing credits on one of the episodes, which took me to the previews rather than the next chapter.